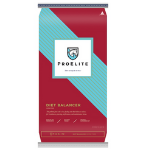 ProElite Diet Balancer is a concentrated feed to help balance forage. ProElite is an ultra-premium horse feed designed to deliver the competitive edge your horses need to stand above the rest. Our formulas are infused with a special blend of ingredients specifically developed to boost performance, speed recovery time, and enhance appearance from the inside out. When your horses’ health and performance matter most, you want ProElite feeds.